How long has the ImageMax been on the market? Design started in 1996. We sold our first 100 processors to doctors in the Pacific NW in 1998. Thousands of ImageMax film processors have now been sold to doctors in all 50 states, Canada, Mexico, UK, Germany, and Brazil. How does the ImageMax work? 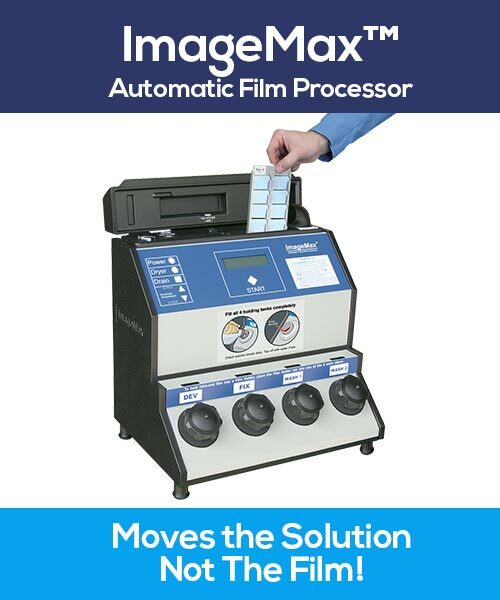 Unlike traditional automatic film processors that move film through open tanks using rollers, belts, or tracks, ImageMax leaves the film stationary and instead moves the solutions. The film never moves! Insert film into the tank. Then using air pressure and vacuum, with a quiet built-in air pump, the solutions flow to the film. No moving parts touch the chemistry other than a simple pinch valve! At the end of the cycle, hot air dries the film. Kodak time/temp tables are strictly followed. Film is developed, fixed, washed twice, and dried, having never moved. No roller marks or artifacts! Just crystal clear dip-tank quality film! Why doesn’t the chemistry become contaminated? If a small amount of developer gets into the fixer, no problem. But if just a few drops of fixer gets to the developer, BIG problem! The key to ImageMax, like all automatic processors and manual tanks, is the sequence: developer, then fixer, then water. ImageMax moves developer into the film processing tank then back to the holding tank. Then fixer back and forth. Finally it washes the processing tank twice before the film processing tank sees developer again. Therefore, there’s no contamination! Is ImageMax difficult to setup? No, it’s very simple! You won’t need any help to install this processor. Simply take it out of the box and put it on your counter. Plug in the power cord. Push on the drain lines. Fill it up with chemistry and water. Set up time is less than 5 minutes! Does ImageMax need a water line plumbed to the processor? No. ImageMax is completely self-contained. Water is quickly and easily poured in from the front. How do I clean ImageMax? Push the Drain button. Go do something else for 3-4 minutes as each holding tank drains. Pour warm water into the Developer holding tank. Gently stir for a few seconds. Drain again. Refill with fresh chemistry. That’s it! No rollers or tracks to scrub! How often would I change the chemistry? How can ImageMax use 80% less chemistry than a roller processor? Other film processors have open tanks that allow solutions to oxidize. ImageMax has sealed tanks which greatly reduce oxidation. As a result, chemistry lasts much longer. 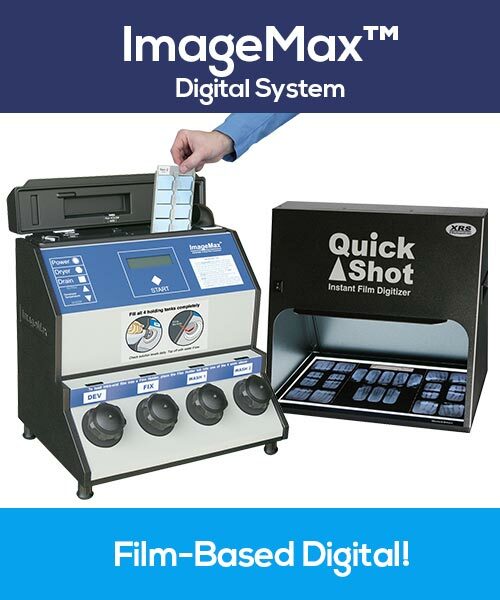 In addition, ImageMax does not replenish – a wasteful technique that adds more chemistry to the tanks attempting to maintain film quality. Instead, ImageMax fully utilizes its one quart of chemistry by using a time shift method. As the chemistry ages, ImageMax automatically adds a few seconds of processing time to compensate for weakening chemistry. As a result, substantially less chemistry is used and film quality remains consistent. Does ImageMax require special chemistry? No. Any high-quality roller-less chemistry should work. However, 95% of our customers use XRS chemistry because it’s designed specifically for roller-less processing, it’s economical, it saves space, and it’s very high quality! Why are the films so much better? ImageMax has essentially gone back to a dip-tank method of processing x-ray film – but fully automatic! There are no rollers to put marks on the films and precise computer control of how film is developed. It’s truly a next generation film processor! How long does ImageMax take to process a film? About the same as other processors, but if you need the film quickly you can take the films while drying. Intra-oral films are in a holder, so just “tap” the holder in your hand to remove any water droplets. Film will then dry in just a few seconds. Cycle time without the dryer portion is then approximately 3-1/2 minutes. What if I have problems? How do I get service? We include FREE phone tech support! Because we’re the factory, we can usually solve the problem with you right over the phone. However, if we can’t, then we have loaners available. 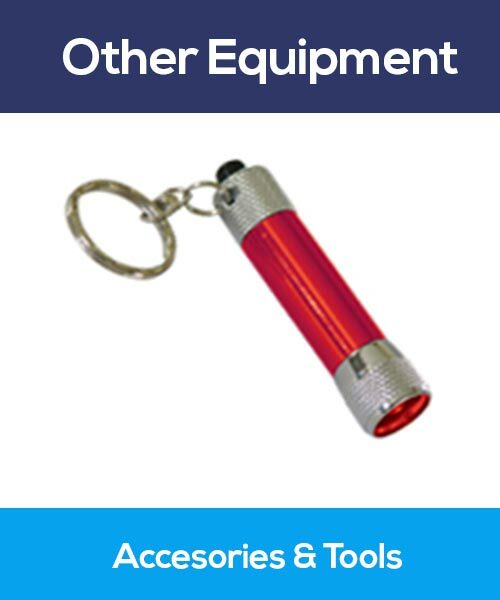 This avoids costly on-site repairs! UPS brings the loaner to you. Then use the same box to send back your unit for repair. Quick and simple! Where can I see an ImageMax in action? In your own office! Try it risk free for 14 days! If ImageMax doesn’t suit your needs or meet your expectations, we’ll refund your money! We’ll even pay to ship it back! No risk! What makes QuickShot QS-300 superior to a standard scanner? Speed: The QS-300 is instantaneous! It uses a HD camera to provide a live high-resolution camera feed. A standard high-resolution backlit scanner can take several minutes to scan an image. Image: Because the QS-300 uses a camera, you make image exposure and contrast adjustments BEFORE the image is captured. Standard scanners capture an image then you have to manipulate the image after it’s captured. 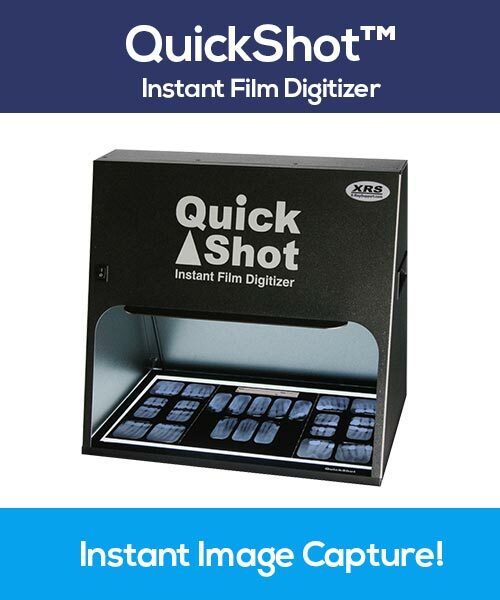 Software: Unlike scanner software, QuickShot Capture software is extremely easy to use! 3 Steps; Crop, Adjust, then either Preview, Print, or Save. LIFETIME Warranty: No other scanner company has ever dreamed of offering a lifetime warranty. What film does the QS-300 digitize? All dental film! Pan, Ceph, TMJ, mounted intra-orals, and individual intra-orals (sizes 0-4). Standard image formats. JPG (JPEG) and PNG. Both formats provide excellent image detail. JPEG’s are slightly smaller and best suited for being sent via email to insurance or for referral. PNG’s are slightly larger and provide slightly more detail. Can the QS-300 interface with my current practice management software? Yes, if your software supports import of standard image JPG and PNG formats. Contact your software provider if you have questions. Here’s how QuickShot works with your software. First, create a folder on your desktop called QuickShot Images. From QuickShot Capture, save your QuickShot images to that folder. Then from your practice management software import from that same folder. Can QuickShot be used as a stand-alone system? Yes. Create a file folder on your desktop called QuickShot Images (or whatever folder name you like). When you save an image from QuickShot, you have the option to add the patient name, date of birth, exposure date, and image sequence number. It is then easy and fast to search the folder to find patient images. Why are the digitized x-rays monochrome? Standard X-Ray film is black and white. Color is not necessary so QuickShot is designed with a high-resolution monochrome camera. RGB (Red-Green-Blue) image data adds no value to a monochrome image. In fact, the extra data actually reduces the image detail and produces a larger file size. Software updates to QuickShot Capture are available on our website at no charge. How does the QS-300 connect to my computer? Via a standard USB 2.0 connection. A 6′ cable is included. What computer operating systems do I need to run QuickShot? Microsoft Windows running 7, 8, or 10.